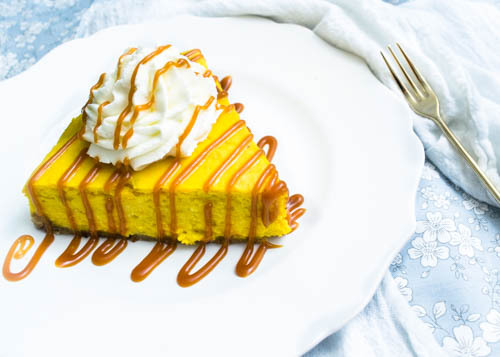 Make this pumpkin ricotta cheesecake and fall in love with the smell as it bakes! You will hardly be able to wait for it to cool! It is so delicious; you won’t regret making it! When making this you can make your own home-made ricotta and you can make your own pumpkin puree. When making your own puree you can scrape out the seeds, rinse them and then bake them for a healthy and delicious treat later. It’s always so fun to make things from scratch! Now, this pumpkin ricotta recipe is unique because it uses ricotta! The ricotta adds a creamy texture that is out of this world! A friend called this cheesecake a super creamy pumpkin pie. Sounds amazing to me! The crust is made of nuts and adds to the richness of the dessert. It’s crumbly and nutty and just plain delicious! You will definitely want to give this a try! This week my husband and I are going to Colorado to watch our dear friends get married!!!! Not only am I excited to go to a wedding and see lots of friends from college, but we get to go to Colorado! I’ve been to Colorado several times, to go rafting, to speak at a conference, I’ve experienced Denver and its large amounts of delicious foods, and I’ve experienced the Black Canyon of the Gunnison but I’ve never been to the Boulder area and that’s where we are headed next week! (PS Everyone should check out the Black Canyon of the Gunnison- it is amazing!) Where are your favorite places to go in Colorado? I’m going to take some of this cheesecake to my old roommate, who will be going to the wedding as well. Thankfully, she doesn’t have to wait until we get to Colorado, because she lives on the way and so we will stop by and see her, and then continue on our drive up to Boulder. She is flying in later in the week and we will meet up with her again for the wedding! Anyways, when I told her I was bringing her Pumpkin Ricotta Cheesecake, she was thrilled. We both love everything about this recipe. My husband, who isn’t a huge cheesecake fan, also enjoyed it! So WIN! And, seriously, make the caramel sauce- it is SO GOOD! Oh, and might I add it doesn’t have any corn syrup in sight! (I really don’t like corn syrup….). This is a delicious treat whether you are making it for Thanksgiving or for an old roommate. Everyone will love it! 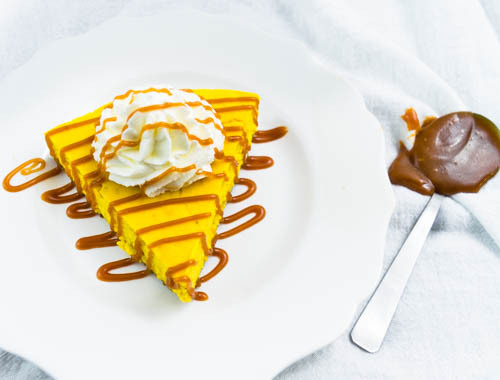 It will satisfy your sweet tooth and your craving for a pumpkin dessert! I am super excited to see the beauty of the Rockies again and to smell the fresh, crisp air! Not only is it Colorado, but it’s FALL in Colorado! I plan on collecting lots of colorful leaves and preserving them! Something I like to do every fall- it’s an easy and cheap way to decorate! I wrote about how to do it here: Pumpkin Spice Waffles. I heard it is going to be cold when we are up there, and snow will come only a few days after we are gone! It’s been 85°F or hotter here in NM, with it getting cold only late at night, so I am super excited for sweatshirts and hot cocoa in Colorado! Not only do I love the outdoors, but it’s been way too long since we’ve seen our college friends. The last time we were all together, was another friend’s wedding, nearly 8 months ago! I am looking forward to laughing lots, listening to stories I’ve heard a hundred times and catching up on all the new things! It’s going to be so much fun! Enjoy making and eating this delicious cheesecake. Maybe grab friend and make it with them! Either way, it is a dessert that will delight your senses and will please a crowd! 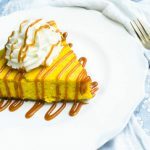 A delicious cheesecake perfect for Thanksgiving or anytime you need something with a pumpkin kick! Combine nuts in a small food processor and pulse until they are finely chopped. Add flour and sugar and pulse to combine. Mix with melted butter and egg. Press mixture in the bottom of a 9” springform pan, making sure the whole bottom is coated and there’s a little bit of crust coming up the sides about ¼’ high. Stick the pan in the freezer until ready to use. In the bowl of a stand-up mixer, add the cream cheese. Use the paddle attachment for 3 minutes on medium speed until cream cheese is whipped. Add ricotta and pumpkin puree and mix on low to combine. Add sugar and mix on medium speed for 2 minutes or until well incorporated. Add pumpkin spice, vanilla, and flour, mix to combine. With the mixer on medium speed, add eggs one at a time, waiting for each egg to incorporate before adding the next one. Also, make sure you don’t overbeat the mixture, which adds too much air to the mix and most likely will make your cheesecake crack. Wrap a couple of sheets of aluminum foil around the bottom of the springform pan and place the pan in a larger roasting pan for the water bath. The foil will make sure the crust doesn’t get soaked by the water from the water bath. Pour filling into crust and place it in the oven. Pour about 3 cups of hot water in the roasting pan. Bake for approximately 45-50 minutes, until cheesecake is slightly jiggly but appearing to be set. Remove from the oven and run a thin knife right around the cheesecake between the cake and the pan. This helps to avoid cracks on the top of the cheesecake when the cheesecake cools and shrinks away from the pan. Refrigerate for at least 4 hours before slicing. Serve with whipped cream and caramel sauce. Put sugar in a medium sauce pan and and melt over medium heat. Stir constantly to help it melt evenly and to avoid burning. Once all the sugar is melted, stop stirring and watch very closely as it simmers. When the melted sugar has an amber color, it’s time to remove from the heat. Don’t let it pass the amber color point because sugar burns very quickly and you don’t want to taste bitter burnt sugar. As you remove the sugar from the heat, immediately add the butter and stir until all the butter is melted. Add heavy cream and stir until incorporated. Place the pan back on the stove over medium-low heat, stirring constantly. After it is combined, increase the temperature to medium and bring the mixture to a quick boil. Cook, stirring vigorously for less than a minute, to thicken slightly. Remove from heat and let it cool before transferring to another container. 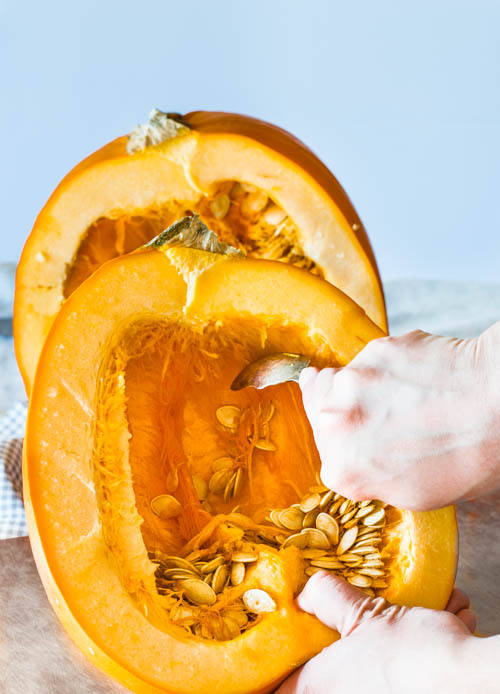 Cut pumpkin in half and remove the seeds. Discard the seeds or set them aside and roast them later for a delicious snack. Place each pumpkin half with the open side facing down on a baking sheet lined with a silicon mat or parchment paper. Roast in pre-heated oven for ~45 minutes. Cooking time will depend on the size of your pumpkin. I like to use sugar pumpkins which are small and bake faster. You will know the pumpkin is done when it is soft and a knife cuts it easily. Remove the pumpkin from the oven and let it sit until it’s cool enough to handle. Remove the softened flesh and place in a food processor and process until smooth. If your pumpkin seems too dry, add a tablespoon of water to the food processor. The pumpkin puree should be juicy and wet. Remove 2 cups to use in this recipe and use the rest for another recipe. Pumpkin puree also freezes well. It will last a long time in your freezer if it’s well packaged. About 1 year! I’m sure you will have pumpkin puree needs before a year though if you are anything like me! When making the caramel, if your mixture gets too cool while adding the butter or cream, it won't mix well. To fix this you can put it back on the burner over medium-low heat, stirring constantly.